Alien researcher Scott C Waring has claimed to have spotted several anomalies in pictures of Mars and Moon released by NASA, and it has made many people believe that alien life could be a reality. Now, the researcher has uploaded a set of images from Mars taken by NASA's Curiosity Rover, and claimed to have spotted an Egyptian sarcophagus on the Red Planet. 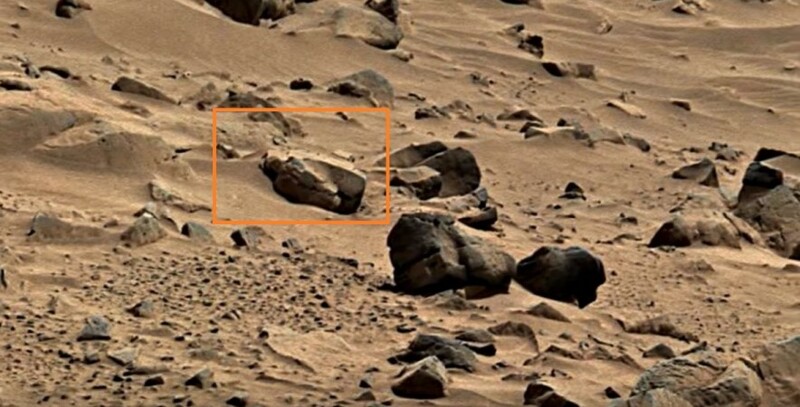 "Here is an ancient sarcophagus on mars as seen in the original NASA photo. There are actually three of them, but two had fallen the other direction and only one had fallen towards us, which allows us to see its lid. The lid of the sarcophagus has a figure of a person on it. , It's easy to make out the head, shoulders, and body on top of the lid," wrote Waring on his website UFO Sightings Daily. Waring also claimed that he has spotted several artifacts including ancient pillars and structures on Mars. As per Waring, an advanced alien civilization had once lived on Mars, and they could have perished from the planet thousands of years ago. A video uploaded to YouTube about this discovery has already caught the attention of alien believers, and many people argue that Waring's research is unique in the process of disclosure. Some other users claim that the weird shape of the sarcophagus-like object clearly indicates that it is built by alien beings. "Very, VERY strange shape if at all "Natural"? Mars - this whole Planet is an Anomaly!!!" commented Owl Ernator, a YouTube user. A few weeks back, Scott C Waring had discovered weird structures on the Red Planet, and he claimed that these structures were actually alien fossils. After making this discovery, Waring alleged that employees in NASA are not doing their work properly, and that the United States space agency is becoming obsolete. He also urged Donald Trump to make him the head of NASA, so that he can unveil several mysteries surrounding the existence of alien life on Mars.